What Hacker actually shows is that the average level of income volatility is rising. But we know that an average can hide as much as it reveals. And this is the point brilliantly developed in a provocative new working paper by my Wharton colleague Shane Jensen, and my former colleague Stephen Shore (full paper available here; warning, there are some econometric pyrotechnics involved). 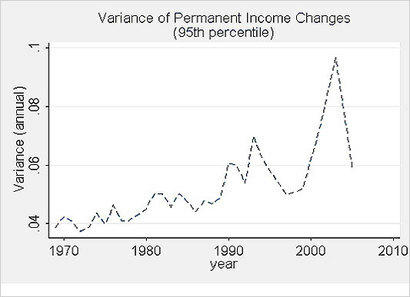 Income volatility is not a single number — some people’s incomes move around over time more than others. 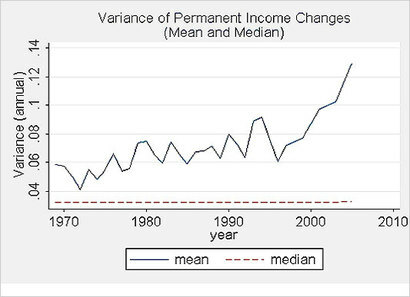 And while Hacker and others have documented a rise in the average level of income volatility, Jensen and Shore document changes in the entire distribution of different people’s income volatilities. Indeed, there’s been no change in income volatility for most of the distribution: Here’s the punch line:The key driver of rising average levels of income risk is that life among the already risky has become even riskier. Indeed, you really need to look to the riskiest 5 percent of the distribution to find the rise in income risk. And this rise in risk among the already risky is so great as to be responsible for nearly all the rise in average income volatility. And who are these riskiest 5 percent? Jensen and Shore find that they are particularly likely to be self-employed. The Jensen-Shore analysis yields an interesting scorecard: Hacker was right on average, but wrong for 95 percent of us. …Perhaps the debate about the Great Risk Shift isn’t such a big deal after all: the best argument for a social safety net is that there is too much risk, not that risk has grown.Full details, including technical wizardry, here. [F]amily income volatility is scarcely the only measure of economic insecurity or the “risk shift” that I and others have discussed. Only one chapter in my book is about family income instability. The rest are about pensions, health care, the decline in traditional job security, the increasing debt burdens reflected in families’ financial balance sheets—in short, about the whole range of economic risks that Americans face. Many of these risks, such as health costs, retirement insecurity, bankruptcy, and mortgage foreclosure, either do not show up in the incomes of working-age people or show up only weakly. Originally posted at Economist’s View and reproduced here with the author’s permission. 2 Responses to "“Is Income Volatility Really Rising?”"